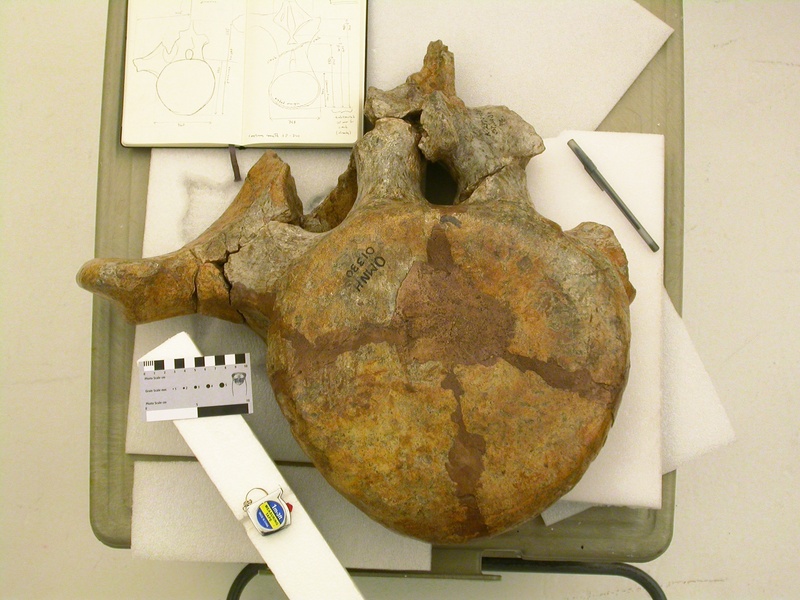 Here’s another vertebra from the big Oklahoma apatosaurine. Based on the size and shape of the transverse process, and the large pneumatic chambers on either side of the neural canal, I think this is probably a 4th caudal, but it could plausibly be a 3rd or a 5th. The centrum is 33 cm tall by 36 cm wide. WOW!!! The size of that sucker!! Yeah, it’s a pretty wonderful thing. So, 25-30% bigger than CM 3018, which is right in line with the other elements of the Oklahoma giant. Interestingly, not much bigger than FMNH P25112. That one’s an odd beast. The mounted skeleton is made of two individuals, back half of one and front half of another. And the hindmost individual is oddly proportioned – the femur is only 2.5% longer than that of CM 3018 (1830mm vs 1785) but the proximal caudals are about 30% larger in diameter. Not sure what to make of that. Are there any appendicular elements of OMNH 1331 floating around? A few. The best is a complete tibia that is IIRC 135 cm long, compared to 111.5 cm for CM 3018 and and 101 cm for UWGM 15556. There’s an astragalus that goes with that tib, that Matt Bonnan said was the biggest sauropod astragalus he’d ever seen. And there is a very big scap with a broken blade. I have pics of all of these things, will start getting them up as and when. Just proof that everything gets bigger as you get closer to Texas. except for Amphicoelias fragillimus, for which I have new archival proof to be published later this year. Really looking forward to Carpenter’s paper. Could these be photos of Amphicoelias in situ with a worker or two for scale?? ?